Flying with American Airlines? Find out everything you need to know about American Airlines baggage allowance, fees and restrictions. American Airline passengers are permitted to carry one piece of hand baggage on board their flight and one personal item that must be able to fit under the seat in front of you. This would include a purse, a briefcase, a laptop bag or similar items such as a tote. Hand baggage must be no bigger than 56cm x 36cm x 23cm including handles and wheels. However, it should be noted that Basic Economy passengers travelling within the US, Canada, Mexico and the Caribbean are only permitted to carry one personal item on board, such as a briefcase, a laptop bag or otherwise. All other bags must be checked. On domestic, transatlantic and transpacific routes, passengers can check up to ten bags per person. Passengers can check up to 5 bags if they are travelling to, through or from Mexico, the Caribbean, Central America, South America and Brazil – however, it should be noted that there are seasonal and year-round baggage restrictions on these routes (please visit the American Airlines website for more information on these restrictions). On domestic flights, Economy passengers may check one piece of baggage for $25. For a second piece the charge is $35, the third is $150 and any additional baggage is charged at $200. Please visit the American Airlines website for more detailed information. On transatlantic flights, Economy passengers are permitted to check one piece of baggage at no charge. Should passengers need to book any additional checked baggage, there is a charge of $100 for the first additional piece and $200 for any additional pieces. In some cases, you won’t have to pay the baggage fees for up to 3 bags if you are eligible. Please visit the American Airlines website for more information on this. For all regions, checked baggage must not exceed the total dimensions of 158cm, and must not exceed 23kg in weight. However, for First and Business Class customers, checked baggage must not exceed 32kg. Fees apply to oversize/overweight baggage. If your checked bag exceeds the weight allowance of 23kg, or exceeds the total size restriction of 158cm, excess baggage charges will be applied depending on your route. It should be noted that these fees are non-refundable, applied per person and each way. For more detail on these charges, please visit the American Airlines website directly. First and Business Class, Executie Platinum and oneworld Emerald members can check baggage up to 32kg at no additional cost. However, please note American Airlines do not accept any checked baggage over 320cm in total dimensions, or over 45kg in total weight. Special restrictions, exceptions and charges can apply when you’re travelling with exceptional baggage such as sports equipment or a musical instrument. Restrictions and charges are variable according to the particular item and route traveled. For example, if you are taking golf clubs with you, you will be charged the same fee as the 1st or 2nd baggage fee of your destination. You can travel with 1 golf bag with up to 14 golf clubs, 12 golf balls and 1 pair of golf shoes. If the golf bag contains anything other than the approved items, additional oversize and overweight charges will apply. If you are travelling with a small musical instrument, this can be your carry on item on a first come, first serve basis as long as it fits in the overhead bin or fits under the seat in front of you. If they are too large to be carried in the cabin, they can be checked into your hold luggage. The maximum size is 381cm with a maximum weight of 75kg. Carrying baggage with you on your American Airlines flight is an easy option if you are travelling with a small amount of luggage. However, if you need to bring excess baggage on your American Airlines flight, you will find that the excess baggage charges can be extremely expensive and substantially increase the cost of your overall journey. 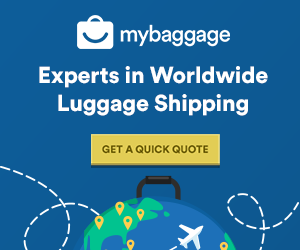 A luggage shipping service such as My Baggage provides a great, low cost alternative to international airline baggage fees. With a full door-to-door service, there’ll be no heavy luggage to carry and no waiting at luggage carousels – one less thing to worry about! My Baggage allows you to ship a massive 30kg suitcase at fantastic low rates. You can get a free instant quote online to see exactly how cost-effective our service can be. You’ll also have the option to pay extra for even heavier bags, if you need to, you can add as many items as you like to your booking. Shipping your luggage ahead allows you to bring more with you than if you were simply relying on a few pieces of checked baggage. Simply book online and My Baggage will collect your luggage and deliver it quickly and safely to where it needs to go. As well as providing a reliable door to door service, My Baggage offers luggage tracking, SMS and email notifications along the way. We ship to over 200 countries worldwide, across over 1000 routes. What are you waiting for?